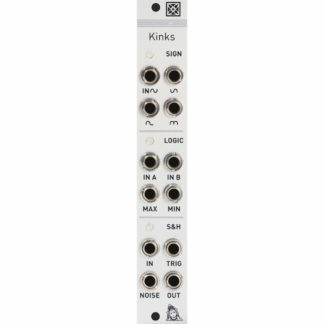 TheNoise Engineering Sinc Defero is a buffered quad attenuator for eurorack modular synths. It features LED indicators for easy visualization that facilitates tactile performance. 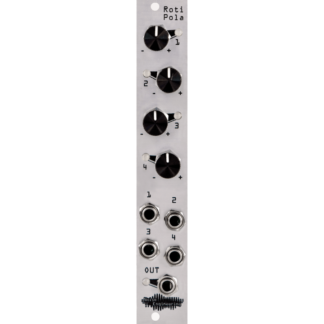 The inputs are normalled so that a single input can be multed (via buffered outputs) to all outputs if desired. If further signals are input, the normalling is broken at that point, and the new signal is sent to all the following outputs. Patch a single CV signal into input #1. Patch the corresponding output to an input on an oscillator, for example, the Basimilus Iteritas Alter. Turn the attenuator to turn the CV level up and down. 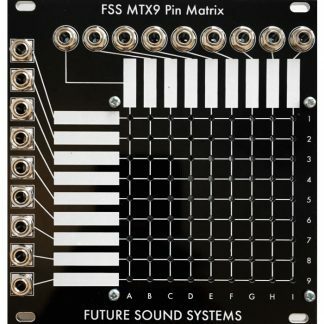 Add patch cables to other outputs and send them to other inputs on BIA. The single input is sent to all outputs. Add a second signal to input 3. 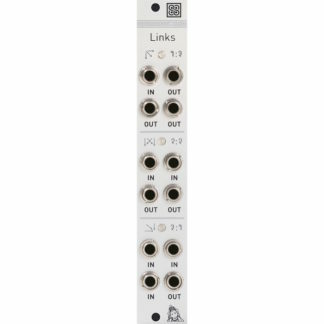 The signal on input 3 is now sent out of outputs 3 and 4. The original signal is still sent out of outputs 1 and 2. In 1-4: CV Inputs. Inputs are circularly normaled so a single input can be sent to all outputs or as few as you like. Attenuators 1-4: Attenuators for each channel. Fully CCW mutes a signal. Indicator LEDs show the incoming and outgoing signals, with green for positive voltage and red for negative.